1. Introduced unpaid, unlimited workfare for those deemed too sick or disabled to work by their doctor. 2. Scrapped crisis loans and community care grants for the most vulnerable. 6. Planning to curtail human rights, guaranteed by membership of the EU. That is written in their Program for Government, and has been planned from the very start. 7. Introduced charges for Child Support Agency, so that vulnerable single parents have to pay to get maintanance from absent fathers, for their children. 8. Introduced the Council Tax Bill, with the same unfair principles as the Poll tax Bill, sneaked in via the Localism Bill. The poorest will pay the most. 10. Sold off most of the Council housing stock. The numbers of homes built under the Tories are at levels lower than any time since the Second World War. 17. Introduced PIP to replace DLA, with the aim of cutting 500,000 vulnerable people from the figures before any assessments have happened. 18. Removed basic rate ESA for sick and disabled people for those wishing to appeal their ESA decisions from October 2013, whilst they await a mandatory review. From April 2013 for JSA. 21. Encouraged hate crime by using the “scrounger” and Nazi “burden on the State” style propaganda in speeches and in the media about the sick and disabled, and the unemployed, fed politicised press releases to the Media. Yet £66 billion goes unclaimed every Parliament in benefits. 22. Introduced authoritarian “monitoring” of the BBC, and other media , for “left wing bias”. 27. Suggesting in the PIP regulations that a sick or disabled person can “bathe” if they can wash above the waist only. 28. Re-classified paraplegics as “fully mobile” if they use their wheelchairs too well. 29. Lying about Workfare repeatedly to the press. The Tory Work Programme has delivered less than a 2% success rate, after they ignored NAO warnings it was a waste of money. 30. Falsifying internet documents and issuing press releases to make workfare look successful when it’s a corrupt sham. 31. Reduced employment, workers pay, and workers rights. 37. Are responsible for an average of 73 deaths per week of sick and disabled people as a consequence of “reform”, despite denial that is so, the Government have nonetheless refused to monitor and account for the deaths of those Atos has declared for to work, and those awaiting appeal. 38. Introduced the grossly unfair Bedroom Tax. 39. Made squatting illegal, and at a time when their own policies have led to a rise in homelessness. 40. Significantly reduced access to the provision of digital hearing aids through the NHS (again, the same rationing happened under the Thatcher Government). 41. Local Authority budgets reduced, and Every Child Matters – Labour’s comprehensive child protection and welfare policy – demolished the day after the Coalition got in office. Preventative social work is no longer funded effectively, only “crisis management” possible, and even that provision is now being rationed. 42. Introduced targets and financial incentives for euthanasia in hospitals, to “save health care costs”. This involves withdrawing food and fluids from “frail” patients, including sick babies. 43. Quietly removed key sections of the Equality Bill (Labour flagship policy) , rendering it much less protective of basic human rights. 44. Capped housing benefit, whilst private landlords are recouping a record amount of over £42 billion a year from tenants, rather than capping private rents. 45. Lost the Moody’s Investors Service triple A grade, despite pledges to keep it secure. Moody’s credit ratings represent a rank-ordering of creditworthiness, or expected loss. 46. Fitch credit rating downgraded due to increased borrowing. 48. Public sector pensions decreased but contributions increased. 53. Set DWP targets to sanction benefit claimants unfairly, depriving them of a means of meeting their basic living needs. 54. Scrapped the Independent Living Fund. 55. Introduced Personal Independence Payments to replace Disability Living Allowance, with the aim of cutting benefit for more than 300,000 disabled people. Although Esther Mcvey said the Government has built ‘robust expectations of performance’ into PIP contracts with Atos Origin and Capita’, we know from that comment that this means inbuilt targets to reduce eligibility, since the anticipated saving was announced by Government PRIOR to any assessment. 56. There are now 600,000 less public sector workers than there were when the Tories came to Office. 57. The Universal Benefit Payment has forced families to move into squalid housing, typically defined as the lowest 33% of houses by rental value in an area. Given that 46% of private rental homes are deemed sub-standard, (ONS). 59. Failed to make permanent the Bankers’ Bonus Tax and profiteers in the City of London are still being rewarded, disproportionately, for taking unnecessary risks and they have also refused to cap bankers bonuses. 60. Refused to regulate the Fast Food industry. Instead, they asked their nudge unit to consider “fat taxes” on the poor. They even stopped obese people having access to some NHS operations. Unashamed of their deeds, one Tory MP said NHS Patients should pay for their medicines if they contract illnesses through “Lifestyle Choice”. 61. Guilty of blatantly sexist policies, the Tories have Tax Credits which impacts on women with children in particular that want to work, and accused feminists of holding back men. 62. The Tories have wasted more than £90 billion of taxpayers’ cash, on policy schemes that are doomed to failure. 63. The Tories have increasingly refused Freedom of Information Requests, and have changed the rules to make it easier for an FOI request to be refused. 64. 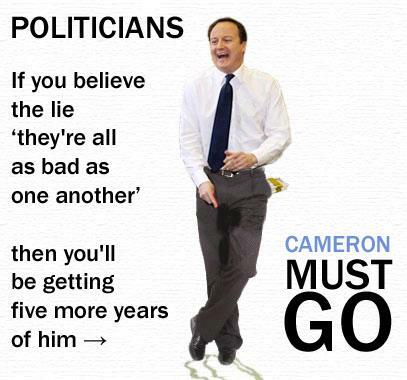 The Tories have axed 5,000 fire men & fire women. 65. The Tories have axed 28,000 staff in police forces throughout the country. 66. The Tories have accepted £20 million of donations from people who have directly benefited from their corrupted policies. 67. The Tories scrapped the 50p rate of Tax, and in doing so have given a tax cut to millionaires. 68. Increased borrowing – admit they will now have to borrow well over a £150 billion extra this parliament because of their failed growth. 69. The numbers of workers paid LESS than the National Minimum Wage has grown under this government, with women being the worst affected. 70. The number of working households now relying on Housing Benefit to make their rent payments has doubled. 71. Deliberately underfunding and sabotaging the NHS, at the expense of patient welfare to justify full privatisation. Lying about funding. 73. When Labour left office NHS Patient Satisfaction was the highest it had ever been (73%). It has since taken a record slump to (58%). Just over half of people are now happy with what the NHS has to offer. 74. Post code health care lottery – children’s access to expensive cancer drugs now vary from trust to trust. 75. NHS treatments for cataracts, hip replacements, and physiotherapy, amongst other essential treatments, are no longer available free of charge on the NHS in some parts of England. In total, 22 treatments are now restricted. 76. Over 4,000 nurses have been axed under the Tories and thousands more have received redundancy notices. 77. Michael Gove scrapped EMA that the Institute of Fiscal Studies called ‘value for money’. His decision was not based upon the deficit since he first sought to scrap it in 2004. 78. Michael Gove has closed more than 200 schools at a time when class sizes are rising. 80. Cancelled Labour’s plan to roll out free school meals for middle-class families at a time when evidence shows more families are in desperate need of the meals. 81. Infant mortality rates have started to rise again after a long period of them failing. 82. Ian Duncan Smith is forcing public sector workers to accept a 3% tax hike in their pension contributions against their will or any consultation. 83. Half of England’s Ambulance Stations are being shut down and sold off. In total, 591 hectares of NHS land is up for sale. 84. Gove refused to discuss Ofqual’s letter of concerns about the E-Bacc in front of the Select Committee. The one-off 3 hour replacement of GCSE English has been labelled dangerous, unequal, unaccountable and unprecedented. 85. George Osborne signed a record number of PFI deals in his first year in power that will cost the Tax Payer £33bn. 86. George Osborne raised an extra £41bn in taxes in 2011 at a time when the economy was struggling but cut taxes for the rich. 87. Gas Prices are up 31% under the Tories & 40% of families are on the brink of fuel poverty. 89. Female rates of redundancy are climbing at a faster rate than men. More than 80%+ of workers losing their job in the NHS are women. Huge wage differentials exist between men and women. 91. Halved redundancy notice from 90 to 45 days, the Tories persisted with blaming workers for their declining rights. One Tory MP cruelly judged that British Workers were among the ‘Worst idlers’ in the World. 92. David Cameron has now abolished Equality Impact Assessments meaning that we now have less equal services for disabled, elderly, LGBT citizens. 93. Michael Gove cancelled a plan to rebuild 715 crumbling schools thereby ensuring that all Labour’s great advancements in updating our school infrastructure were put on hold. 94. At least 570,000 more households (1.2 million people) were forced into fuel poverty in one single day when energy companies announced a massive price hike in the winter of 2012. 96. The security arrangements for the Olympics, arranged by the Tories wasted taxpayers’ money, and payed a company £80 million+ for failure, a Tory MP had the audacity to mock the Olympic Ceremony as “Leftie Multi-Cultural Crap”. It has also come to light that the same security company G4 has been robbing the tax payer blind in what is now a police investigation. 97. 74% of GPs say that there has been a reduced entitlement to treatments on the NHS this year. 98. 600,000 people will go bankrupt under this government. 99. 2012 saw record high Clinical Negligence payouts totalling more than £1.2 billion. This is a £500 million increase than payouts under Labour. Each claim takes on average 1.3 years, so the 2012 payouts were for errors in 2010-11. 100. 25,000 businesses have already gone bust under this government. 101. 11,000 Hospital Beds have been axed in 2 years. We now have the lowest number of hospital beds in our NHS in living memory. 102. 10,000 students GCSE English Results were debated in a High Court as Michael Gove oversaw a belated altering of the grade boundaries that unduly punished some students by as much as 2 grades. 103. A benefit cap was brought in that will save just a 110 million a year while the Tory party still ignore the loss of 25 billion in tax avoidance. 104. Iain Duncan Smiths universal credit scheme has turned into a multi billion pound disaster with the software unable to cope on a national roll out. 105. The bedroom tax has not saved a penny and is now costing a lot more money, as those who are affected are having to claim for private rents, that is, if they are not homeless or living in caves around Stockport. Dr Simon Duffy – Who Really Benefits from Welfare? Mind if I use this in a handout and on FB? Thanks for posting this – it’s grim and important stuff. 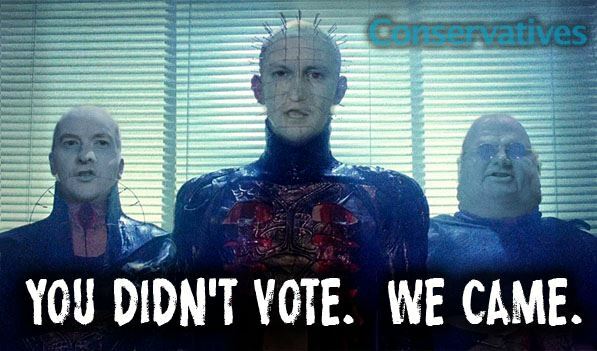 It also struck me that the Cenobite on the right has more than a passing resemblance to Eric Pickles. Now at last we know what parlour games go on at Tory central office: they wait for Murdoch to arrive then pass round the Lament Configuration. Yes, we have to keep grim record of the very grim deeds. It’s a way of remembering how we were as a society before the onslaught and unravelling of our civilisation. My God, when you see it put together like this it’s clear that Cameron and co should be in the dock, not in government. Still think this is about saving the economy and not a class war against the poor and middle class? Awesome list Kitty. If anyone still believes this is about fixing the economy and not just class warfare against the poor they must be mad. Your an inspiration kitty jones! If you wrote a work of fiction and used all of the above as part of the plot people would think it too far fetched. Unfortunately, it’s all too true. What a marvellous piece of work Kitty Jones – well done. Thanks. Yes, you’re right. There is too much material in the list for Bradbury, Orwell, Atwood, Huxley and Paolo Bacigalup to fill a dystopian novel apiece. There would sure be enough to write several volumes. For years to come. If only it were a work of fiction. The disgraceful Liam Fox & his buddy Adam In the Atlantic Bridge episodes. Rebeka, Murdoch and the Conservative connection. Coulson, Murdoch’s man on the inside. William Hague and his bag of weapons. The selling of the UK Plasma. The defiance of the Courts when challenged. Closing of the Coastguard stations. Attempted selling off of our Forests. Christ it’s never ending ! Thanks Derek, yes they need adding, looks like I will have to start a Volume 2 after all…. I thought I’d reblog this piece from Kittysjones’ site, as it gives a very full list of the Coalition’s savage cuts to welfare and the NHS, penalising the poor, the sick and disabled, and the unemployed. What a depressingly long list and virtually no chance of Labour being able or willing to reverse many of them.